Tail-cutting is an important rite of passage in aviation history, which continues to be passed on today. Flying an airplane takes countless hours of practice, and reaching the level of solo flight is a substantial achievement for new pilots. Mary McGreevy, CBU flight instructor, explained tail-cutting comes from a tradition started a long time ago. The cutting of the tail marks the day students are ready to fly on their own, no longer needing instruction. 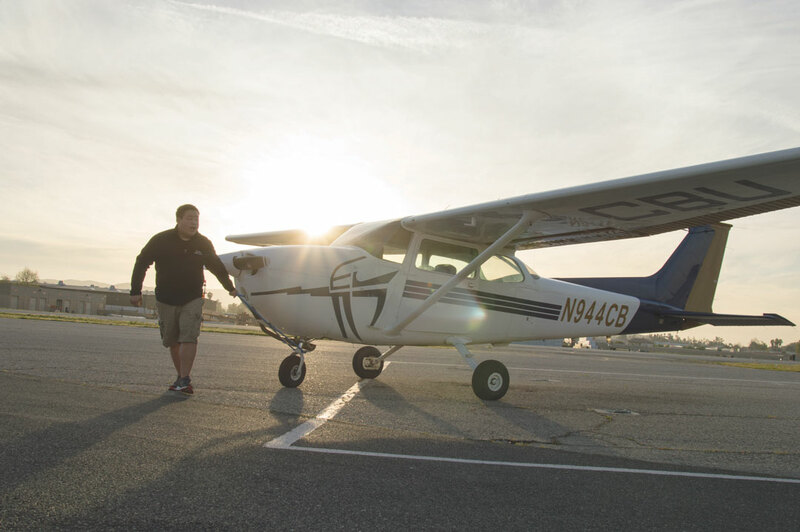 In addition to tail-cutting, the program has an unconventional tradition for new pilots. Upon completion of their solo flight, students are tossed in the fountain at CBU’s Flight Operations Center at the Riverside Municipal Airport. The fountain-tossing is not merely a fun initiation process but holds religious symbolism as well. “We are ‘baptizing’ the student in a way, which is symbolic and of course directly correlates to being Christian, so it’s kind of our own version of baptizing,” McGreevy said. Austin Apple, freshman aviation flight major, and Kevin Chen, freshman aviation flight major, recently reached this milestone. After the first solo flight, Chen said new pilots proceed back to the flight operations center to take part in the highly anticipated tradition of tail-cutting. It is fitting that the first solo flight is commemorated with such a historic tradition after so many hours have been dedicated to the training. While flying planes may be fun and exciting, it can also be risky and learning to take flight can be hard work. “You just have to weigh the balance and ask, ‘Is it really worth it for them to fly?’ I think for all of us, we love flying, we love planes and that’s what we want to do,” Chen said. For students such as Chen and Apple, participating in this small part of aviation history is testament to their passion for flying. “We love it. That’s why we do it,” Chen said.